Hardware failure, viruses and user errors can strike anytime. 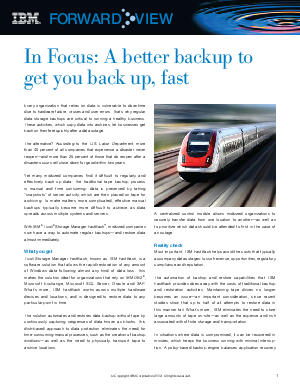 Maintaining regular backups of data is crucial for recovery after such a disaster. But manual processes such as tape backups can be time-consuming. Automate regular backups with IBM Tivoli Storage Manager FastBack and gain the ability to restore data almost immediately. All the details are here in this informative article.